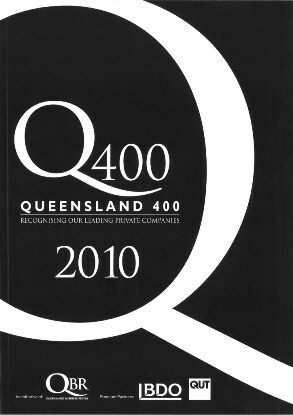 Queensland Business Review (QBR) recently announced the Q400 list for 2010. Elliott Australia is proud to annouce it has moved up in rankings from last year's listing to number 203. Elliott Australia has has been taking part in the Q400 awards since 2008. The prestigious Q400 Awards are the culmination of a year-long program that recognises and celebrates the State's leading private business owners and attracts Queensland's most successful entrepreneurs. The prestigious awards ceremony, held at the Sofitel in Brisbane's CBD, acknowledge the State's best privately owned businesses, assessing their profitability, turnover, assets and staff numbers. Our recognition on the list for third year in a row would not be possible without the commitment of all staff at Elliotts. We would like to thank our loyal partners again for their support this year and also congratulate our customers, suppliers and friends who were mentioned in the 2010 Q400 listing and look forward to a mutually successful 2011.